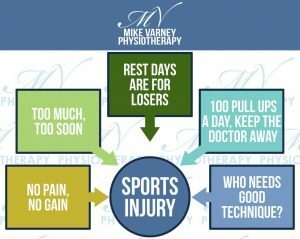 We are all for pushing yourself in training and competition at Mike Varney Physiotherapy. However, there’s a huge difference between pushing yourself, and pushing through physical pain. Athletes who try and push past the physical pain usually end up with an injury. Muscle soreness for 24-48 hours post exercise is very normal, especially if it’s new or an increased intensity of exercise. That sort of soreness will reduce as you warm up, a pain won’t. Stop, and ask a professional! Whether you are starting a new sport, increasing your training or starting afresh in preseason, you must start off right. If you jump into doing the intensity of exercise that you believe you should be able to do or have done in the past and ignore how your body is feeling in the present, you risk injury. It is always better to ease yourself in, gradually increasing the intensity as your body gets stronger and more resilient. Patience and believing in the process are key! We see so many sports people at the Clinic who feel that when they aren’t training or competing, it is wasted time. This mind set leads to over training. This simply means the exercise you are doing exceeds your body’s ability to recover. Over training is extremely common and leads to many over use injuries. Rest days are vital to allow your body to adapt and respond to the work you are putting in. So think recovery time, not wasted time! It’s true you can have too much of a good thing. We all have our favourite exercises, or a part of the body we want to work on, but by having no variation in your training you place too much stress on single muscles or joints. This is when repetitive strain injuries can take hold. So, make sure that even if you have a specific goal, mix up your training to use your whole body in a variety of ways. If you are targeting a road race, you still need to run on different surfaces in training. If you want to build up strength in your chest, you still need to train your shoulders and back. It will help you reach your goal, prevent injury and keeps training more interesting! If you have the outcome as everything and disregard the process it’s easy to take short cuts. So, if you want to long jump over 6 metres, or squat your body weight, often we don’t particularly care how we get there. To correct technique in sport often initially means a worsening of performance. However, if you don’t work on good technique, the bad technique will lead to injury, as you are placing increased stress on muscles or joints that can’t take that load. Whilst in the short-term technique changes can reduce performance, in the long term you will achieve so much more. If you are struggling with any sports injuries call 01279 414 959 to book in for an assessment today!